Washington (CNN) - On the eve of his State of the Union address, Barack Obama's approval rating is at its highest level in more than a year, according to a new national poll. But a CNN/Opinion Research Corporation survey released Monday also indicates that while the president gets high marks on foreign policy and national security issues, a majority of the public disapproves of how he is handling the economy and the federal budget deficit - issues that are likely to dominate Obama's State of the Union address on Tuesday. Fifty-five percent of people questioned in the poll say they approve of how Obama's handling his duties in the White House, with 44 percent saying they disapprove. "The 55 percent figure is seven points higher than in December and 13 points higher than his September mark," says CNN Polling Director Keating Holland. "The president's approval rating has not been this high since November of 2009 in CNN polling." Not surprising, Democrats overwhelming approve of the job Obama's doing, with Republicans disapproving. Fifty-four percent of independent voters questioned give a thumbs up to how the president's handling his duties. "Fifty-three percent of men now have a positive view of Obama's track record, the first time a majority of men have approved of Obama since December of 2009," Holland says. "Obama's approval is now 61 percent in the Midwest - home to key battleground states like Ohio, Michigan and Wisconsin - making that his strongest region of the country. Even among Southerners, Obama's rating is now at 50 percent - something we have seen in our polls in a year." 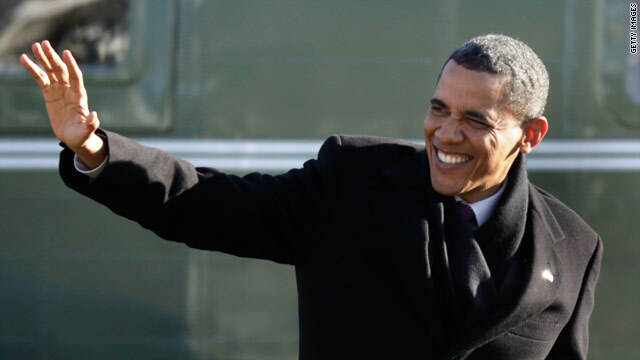 On issues, the poll indicates that Obama benefits from his status as Commander in Chief. Six in ten approve of how he is handling terrorism; 57 percent like his track record on foreign policy and more than half approve of how he has dealt with the situation in Iraq and Afghanistan. But foreign affairs are not likely to take up much time when Obama gives his State of the Union speech. By contrast, Obama continues to get his worst marks on the federal budget deficit - likely to be a major topic on Tuesday night and a growing flashpoint between him and the Republicans in Congress. Six in ten disapprove of how Obama is handling the deficit; 55 percent don't like his record on health care and 54 percent disapprove of his economic policies. The number who approve of how he has handled the economy, although still below 50 percent, has increased five points since November. The president gives his State of the Union address to a joint session of Congress. According to the poll, congressional approval ratings remain very low, with more than seven in ten saying that they disapprove of how Congress is handling its job. The survey indicates that Obama seems to have some residual advantage over the GOP leaders in Congress: 52 percent say Obama's policies will move the country in the right direction; only 46 percent feel that way about the Republican leadership. But Democratic congressional leaders fare as poorly, with only 45 percent saying that their policies would move the country in the right direction. The CNN/Opinion Research Corporation poll was conducted Jan. 21-23, with 1,012 adult Americans questioned by telephone. The survey's overall sampling error is plus or minus three percentage points. Is it me or is the country actually headed in the right direction finally. Is it me or is the Right still complaining that the sun is shining and that its not raining? Is it me or will the Right complain when the country gets fixed, and wont stop whining until theyre back in power to destroy it again?